Come inside! A multi-sports facility in the heart of Europe. Being the capital of Europe since 1948, Strasbourg is the seat of the European Parliament and of the European Court of Human Rights. Because of this status, the educational offer of the city had to stand out for its multicultural approach and its international vision: from this point of view the schools in Strasbourg represents the ideal school of the entire European continent. One of the school responding to this profile is the one located in the neighbourhood of the Robertsau, which is indeed close to the European institution mentioned before: the school covers a full curriculum, from nursery school to the European baccalaureate and hosts different languages spoken by the one thousand pupils. To meet its requirements and those of local residents, the municipal authorities in Strasbourg decided to build an open sports centre: the aim was to create a multi-sport hall and a multi-purpose hall capable of serving as a venue for events not involving sport: the Centre Sportif des Droits de l'Homme. A video shot by David Romero-Uzed for Dominique Coulon & Associates guide us in exploring the structure: using the timelapse technique and the point-of-view shot (with the fisheye effect), we are lead inside the building for a speeded-up tour. Coming up from the road outside the centre, we climb a ramp and enter from the main hall: a transparent space welcome us, allowing sight from the forecourt through to the wood at the back of the site. On the right we spot one of the multi-sports room, illuminated by a glass wall: people are playing sports, living up the ambience, which is mainly made of rough, durable materials: architectonic concrete, galvanised steel, glass and linoleum. Then we move to a inside court, filled with plants: the garden is shown during winter time and almost dry, but it's easy to depict how graceful it can be during springtime, giving elegance to the minimalistic structure. The tour continues to the lockers and the changing rooms, with rapid camera movements, until we reach a field, where students are playing volleyball or setting up the field for a different activity - the visit goes on until we are escorted outside the building. 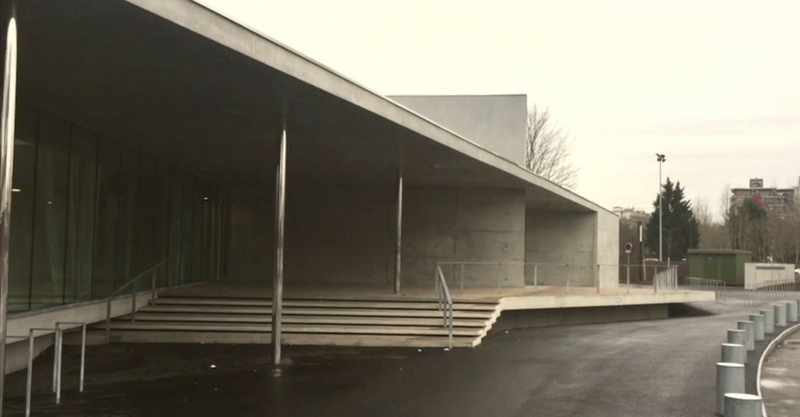 The "Human Rights" Centre in Strasbourg video represents an easy and effective way to portray a building and its functions, guiding the visitor inside, using simple techniques, such as POV shots and the timelapse, enhanced by the upbeat music.